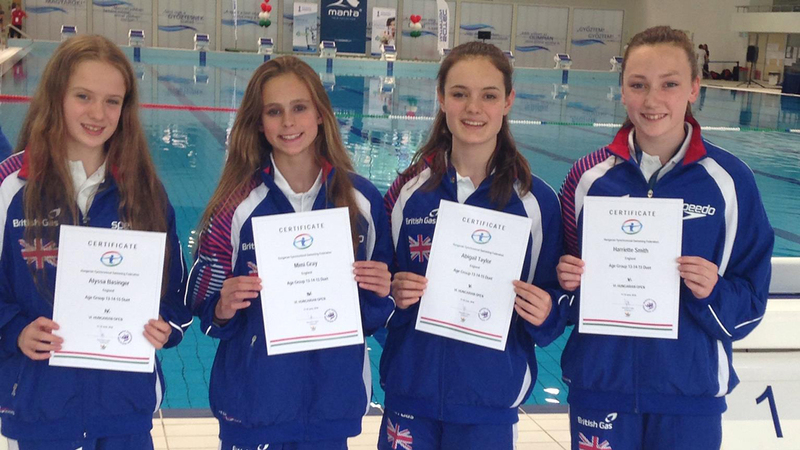 The England Programmes Age Group synchronised swimming squad won Team Free silver at this weekend’s Hungarian Open in Budapest. Competing in the Under 15 age group, the English girls scored 67.0667 for their routine to finish on 127.0802 behind eventual winners Hungary on 131.3062. The English girls’ routine also received the highest artistic impression score of the competition, scoring 27.4667. There were also impressive performances in the Solo and Duet competitions with three finishes in the top five. City of Bristol’s Daniella Lloyd – who finished fourth for Solo at last year’s ASA National Age Group Championships in Gloucester – scored 68.7667 for her free routine to place fourth overall in the Under 15 Solo on 130.6502. Lloyd’s free routine was the second best of the day, more than 1.5 points ahead of eventual silver medallist Julia Mikołajczak from Poland, and 0.6 ahead of Hungary’s bronze medallist Janka Dávid. There was also a fourth place finish in the U15 Duet for Reading Royals’ reigning national age group champions Mimi Gray and Alyssa Basinger. Competing against older swimmers, the 13-year olds scored 64.3333 for their routine to finish on 124.7765 overall, missing out on the podium by just over four points. Harriette Smith and Abi Taylor were one place behind in fifth, scoring 63.8000 for their routine to finish on 124.1409.